The first thing I want to blog about after being away for so long is how I've got rid of my Ombre hair! I can't even tell you how long I've had this hairstyle but it's been well over 12 months so I thought a change was definitely needed. I'd been looking around the Internet a while for a bit of inspiration and in the end I decided I wanted to just go simple and go all over with a brown dye. Due to me having such lighter tips on the ends on hair, colouring my hair back to just one colour wasn't going to be easy. Because I'd applied so much bleach, the ends of my hair were now really damaged and from doing two years in college studying Hairdressing, I knew that bleached hair has had the color pigment removed from the cortex layer that holds color so one application of colour wasn't going to do the job. This is the colour I ended up going with. 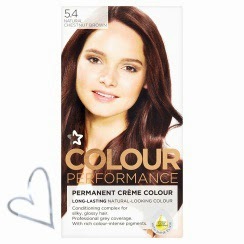 It's the "Natural Chestnut" 5.4 shade from Superdrug's own Performance hair colourants range. Luckily when I went to pick a hair colour, all the Superdrug Performance range was buy one get one half price so that saved me a couple of pound! Since I was trying to achieve an all over brown colour on my hair, I knew that I had to put most of the hair dye on the ends and mid-lengths first. 1. Apply dye to mid lengths and ends, making sure they were all covered. Leave the colour to develop about 10 minutes. 2. Apply the rest of the colour on the roots of my hair. 3. Leave for the remaining time and wash the colour off when ready. Like I said earlier, I knew one round of colour wasn't going to do the job so seeing that the dye had only took it to a medium brown didn't really surprise me. I was meant to be going out the night I did my hair so I didn't have chance to put the second application on so the next day I repeated the above steps again and my hair came out perfect! I know I could have stripped my hair first or primed it before applying the dye but I tried it before and I honestly didn't think the colour lasted any longer than just applying to dye. I'm actually really happy with the results and I'm glad I got rid of the Ombre now. There are times that I miss it but since I've noticed a big difference in my hair condition, it's worth it. I also am really impressed with the Superdrug Performance colour. Although it took two applications to fully cover my hair, it's made my hair condition feel better and the colour hasn't faded at all. I will definitely be using Superdrug's own brand again next time I colour my hair.